What are the considerations when designing a solar shading system? The sun rises in the East and sets in the West. The sun travels in an arc, reaching its highest altitude in the South (for the Northern hemisphere). An important requirement of the design process is to ensure the building is shaded from the sun for as many hours as possible throughout the whole day, during the course of the entire year. However a balance must be achieved in order to ensure that the level of natural light entering the building is not unacceptably reduced. For a predominately south facing façade, a small amount of solar shading can be achieved using a fixed horizontal brise soleil. 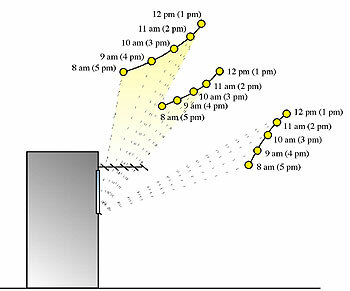 In the mornings and winter such a device cannot stop direct rays of the sun penetrating the building since the sun is much lower. However the heat gain and solar glare is greatly reduced in winter and therefore this may not considered to be a major problem. With a predominantly East or West facing façade, a fixed system will not perform well throughout the whole day as the altitude of the sun is much lower. 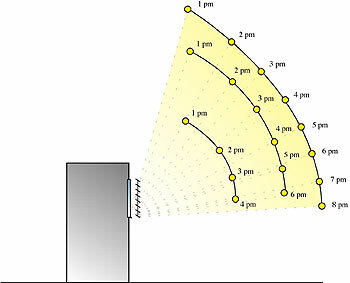 Sunlight will pass directly under most horizontal shading systems as shown in the illustration below. 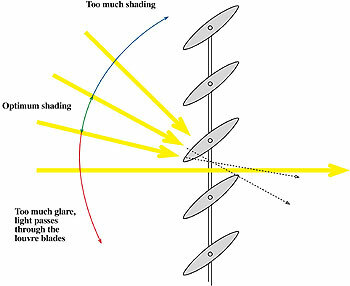 To overcome this problem, effective solar shading can be achieved using a movable solar shading system. Controllable fins, unlike fixed, can hang vertically in front of a window and still optimise solar shading and visibility thanks to specially written computer software which ensures that the louvers follow the path of the sun. Controllable solar shading systems enable the building to react to the changes in the weather and to the sun's position so as to optimise the flows of heat and light energy through the façade. This in turn has a positive effect on reducing the heat load and glare, and enhancing the use of natural daylight, thereby reducing the operating costs of the building. Controllable solar shading systems reduce the likelihood of over-shading or under-shading and will result in optimum shading angle at all times.